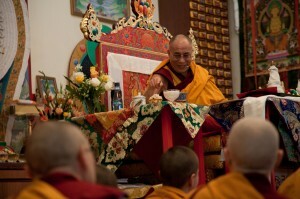 On June 16, 2011, His Holiness the Dalai Lama visited Chenrezig Institute and their newly renovated gompa. Maureen Walsh, the center’s director reports on the exclusive talk His Holiness gave there. In the newly-renovated gompa, the Chenrezig Institute Sangha and 500 members, joined by all of the FPMT geshes from Australia and New Zealand, didn’t have long to wait for His Holiness to arrive. The helicopter arrived 45 minutes earlier than expected! Panic! But thankfully everyone and everything was ready. His Holiness blessed the gompa and listened to a short presentation about the study program, which follows FPMT education programs from the 16 Guidelines through to the Masters Program. As suggested by Lama Zopa Rinpoche, we requested His Holiness’ guidance on integrating the teachings into our daily lives in order to make our lives meaningful. His Holiness was very impressed with the depth and breadth of the study program. He reminded us that ritual for ritual’s sake doesn’t mean anything, it doesn’t change our minds, and that we must always keep in sight the end goal – buddhahood. He also spoke on the importance of shamata (calm abiding) as necessary to furthering one’s practice of compassion and wisdom. His Holiness’ talk in Chenrezig’s gompa is available as an MP3 download.